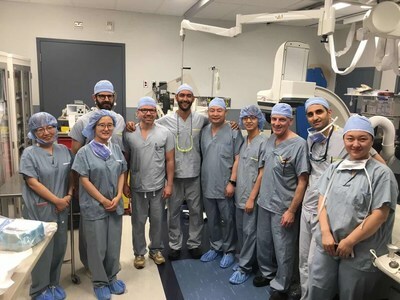 HANGZHOU, China and VANCOUVER, Canada, June 14, 2018 /PRNewswire/ — On June 12, 2018, St Paul ‘s Hospital in Vancouver, Canada successfully completed two cases of VenusP-Valve self-expanding pulmonary valve implantation. This is the first appearance of Venus Medtech’s transcatheter valve products in North America. The pace of internationalization continues to move forward. Although surgical treatment of congenital heart disease has evolved dramatically in recent decades, operations involving the right ventricular outflow tract (RVOT) can still result in chronic pulmonary regurgitation, necessitating either surgical or percutaneous pulmonary valve implantation. Percutaneous pulmonary valve implantation has emerged as a successful alternative to surgical valve implantation in such patients. However, the currently available balloon-expandable percutaneous valves are suitable only for outflow tracts reconstructed with cylindrical surgical tubes. Treatment of pulmonary regurgitation in the setting of prior RVOT patch augmentation has traditionally been limited to surgical intervention. This is mainly due to the limited available sizes of balloon-expandable valves relative to often severely dilated outflow tracts. The self-expanding VenusP-valve has been developed specifically for percutaneous use in the native RVOTs to overcome the challenge of the larger outflow tracts and can fulfill the needs of more than 85% of patients who are keen to avoid sternotomy and cardiopulmonary bypass during traditional valve replacement surgery. In recent years, the transcatheter artificial heart valve systems developed by Venus Medtech have been attracting more and more attention worldwide. The upcoming VenusP-Valve global multi-center clinical trial has received more than 200 applications from nearly 30 countries worldwide. The VenusP-Valve was first implanted in Canada, marking the official entry into the North American market, and the company is expected to officially launch the FDA clinical trial in 2019.